In the early days of motoring, cars were not very powerful. Poor quality fuels which made the engines “knock” caused a major problem. “Knock” happens when the fuel in the engine ignites sooner that it should do, leading to a considerable loss of power. In early 1920 an American Engineer called Thomas Midgley discovered that a chemical called Tetraethyl lead (TEL) was an excellent material for preventing “knock” in engines. It was also discovered that a chemical made from bromine called dibromoethane (DBE) was very effective in preventing the build up of lead inside engines. A number of chemical plants were constructed in the United States to make and blend TEL & DBE together into a material which was marketed as “antiknock compound” The effect of this compound when added to petrol was to dramatically increase the power obtainable from engines and hence miles per gallon. In the late 1930s the UK government feared a war and realising how important antiknock compound would be in the production of high quality fuels for military aircraft ,decided that production facilities should be set up in the UK as a matter of urgency. In 1938 a plant to produce TEL was built at Northwich in Cheshire. A DBE plant was built at Hayle in Cornwall. The plants were commissioned in 1940 just before the Battle of Britain. The use of anti knock compound in our aircraft used in the battle allowed our planes to fly faster and climb higher than the enemy’s aircraft. 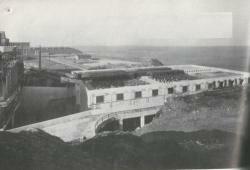 In 1953 a bromine and DBE production site was built at Amlwch. It was important that the seawater from which the bromine is extracted is as clean as possible, could be replenished with fresh seawater quickly and was warmed by the Gulf Stream. Three factors which influenced the decision to built the new plant at Amlwch. For many years the business was based almost entirely on the production and sale of the antiknock compound for use in leaded petrol. In the 1980s unleaded petrol was introduced which slowly reduced the demand for the anti knock compound. In the late 1990’s the Amlwch site was taken over by “Great Lakes Chemicals limited” The site has moved away from producing DBE for petrol into producing Bromine and Bromine intermediates for use in a wide range of consumer products such as Pharmaceuticals, Dyes, Flame retardant, agrochemicals and water purification systems.